193887062X -Emerging and experienced health services managers can hone their skills with these challenging and in-depth case studies. 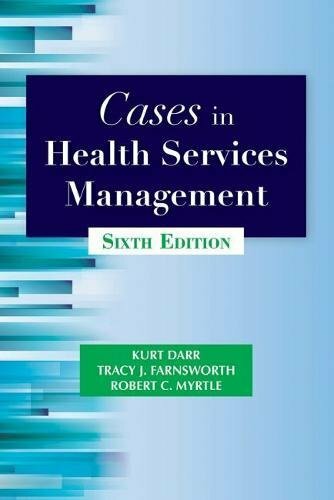 With more than 50% new content in this sixth edition, Cases in Health Services Management includes 28 cases and 12 ethics incidents that address contemporary issues encountered by administrators and managers, such as organizational change, ethical dilemmas, conflicts of interest, regional competition, staff misconduct, and patient safety. Complex, real-life management scenarios are presented for analysis, evaluation, and resolution by using a problem-solving methodology and applying knowledge, skills, and expertise from all areas of healthcare administration. The cases are wide ranging and cover varied healthcare settings, including: Hospitals (large/small, urban/rural, academic), long-term care facilities, pharmaceutical services, specialty and outpatient centers, and other service delivery settings. Providing an exceptional framework for decision making and debate, this casebook is an outstanding text for capstone and issues courses as well as a valuable resource for professional development seminars for practicing administrators and risk managers in health services settings. INSTRUCTOR MATERIALS FOR FACULTY: Case summaries, exercises and role-plays, discussion and debate questions, timelines, decision tress, and supplemental documents.